Always get 2x the Miles1 with the BMO®† AIR MILES® Mastercard®*! at participating AIR MILES® Partners. That’s 2 AIR MILES Reward Miles for every $20 you spend on eligible purchases using your BMO AIR MILES Mastercard with no annual fee4. Get a response from BMO in under 60 seconds. Get 500 Bonus Miles after your first purchase2. Get 1 Mile for every $20 spent everywhere else3. Click on the categories below to explore. Enter your estimated monthly spending in the categories below and see how many Miles you can get with your BMO AIR MILES Mastercard. With AIR MILES Cash you can use your Miles in-store and online towards everyday purchases at participating Partners5. You can use the Miles in your Dream Account for Rewards like travel, merchandise and more6. How you want to get rewarded is up to you! Remember to always show your AIR MILES Card at AIR MILES Partners, even when you pay with your BMO AIR MILES Mastercard. 1. What is the “2x the Miles” benefit? And, is there an additional cost for the “2x the Miles” benefit? “2x the Miles” is a new benefit added to your BMO®† AIR MILES® Mastercard®* products with no annual fee as of May 16, 2018. This new benefit gets you 2 Miles for every $20 spent in eligible purchases at participating AIR MILES Partners. You will continue to get 1 Mile for every $20 spent in eligible purchases made everywhere else. There is no additional cost to gain this benefit. 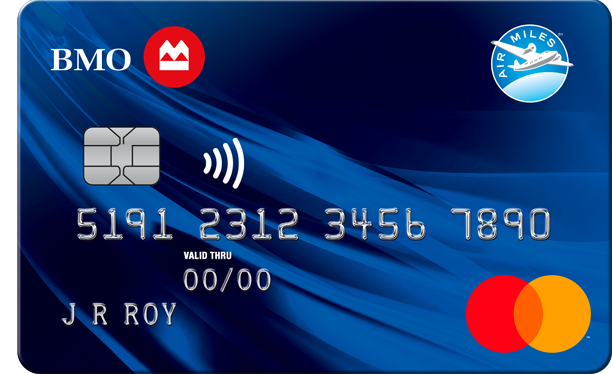 You can continue to enjoy all the great benefits and features of your BMO AIR MILES Mastercard product, without having to pay an annual card fee. 2. If I have a BMO SPC AIR MILES Card, will I get this benefit? Yes, Collectors who own a BMO SPC AIR MILES Mastercard and BMO SPC Affinity AIR MILES Mastercard cards will receive the new accelerator feature on a promotional offer basis from May 16, 2018 to April 30, 2019. 3. Can I earn 2x Miles when I buy travel or merchandise through airmiles.ca? Yes! AIR MILES is considered a 2x Partner for merchandise, top-up and some travel-related purchases made on airmiles.ca and charged to the BMO No Fee card. Travel-related purchases include taxes and fees on flight, car and hotel redemption bookings. Please note, 2x Miles does not apply to the insurance portion of a Travel booking. 4. Is there a limit to how many Miles I can get with the “2x the Miles” benefit at participating AIR MILES Partners? There is no limit to how many Miles you can get with the 2x the Miles benefit. The more you purchase at participating AIR MILES Partners, the more Miles you can collect and the closer you are to getting a Reward! 5. I am an existing customer. How will I take advantage from the “2x the Miles” benefit? Starting May 16, 2018, existing BMO AIR MILES Mastercard cardholders with no annual fee will get 2 Miles for every $20 in purchases on your credit card made at any participating AIR MILES Partner. This increased earn rate applies over your statement period. You will continue to get 1 Mile for every $20 in purchases made everywhere else. 6. What purchases are eligible under the “2x the Miles” benefit? Every $20 in eligible purchases made at participating AIR MILES Partners charged to your BMO AIR MILES Mastercard product(s) with no annual fee qualifies for the 2x the Miles benefit. Please note that refunded transactions, cash advances, cash-like transactions, interest charges, fees, credit and debit adjustments are excluded. Participating AIR MILES Partners may be added or removed at any time without notice; visit the “Partners Near You” section of this web page for current participating Partner details. 7. Why did I not receive “2x the Miles” benefit on my recent purchase made at an AIR MILES Partner? You must make purchases using your BMO AIR MILES Mastercard with no annual fee when shopping at a participating AIR MILES Partner. Participating AIR MILES Partners may be added or removed at any time without notice. Visit the “Partners Near You” section of this web page for current participating Partner details. Miles are awarded on purchases charged to your credit card account only and will be adjusted for refunds. Purchases do not include cash advances, cash-like transactions, interest charges, fees, and credit and debit adjustments. Miles are awarded on every $20 spent in eligible purchases on your card at participating AIR MILES Partners, within a statement period. If at least $20 is not spent, MILES will not be awarded. ®™ Trademarks of AM Royalties Limited Partnership used under license by LoyaltyOne, Co. Partner and Supplier trademarks are owned by the respective Partner and Suppliers or authorized for their use in Canada. ®†/™† Trademarks of Bank of Montreal. ®*/™* Mastercard is a registered trademark, and Masterpass and the circles design is a trademark of Mastercard International Incorporated. Used under license.